Ideally if you follow the given course outline in the bootcamp, you will be done with the course in 30 days. As of now, I have just finished Module 9 which is about creating a freelancing profile. I took my time in creating my Upwork profile overview [as what Jason have also said in the lesson] since I have already been rejected before I entered the bootcamp. 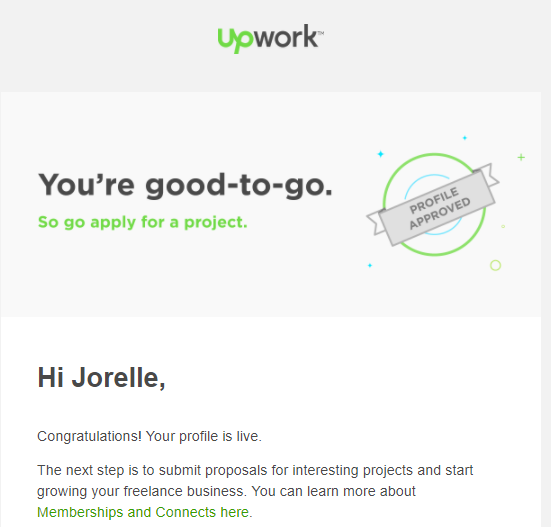 I was able to finally resubmit my profile in Upwork on January 2, and I read their email confirmation on January 4 informing me about the approval of my profile. Finally! My next step now is continuing with Module 10 which is about applying for jobs. I am hella nervous and scared right now as I progress with the course. I am scared of messing up, of rejection, of failure. I am scared of doing this all by myself. I am imagining things like what if I blanked out while having a talk or an interview with a client? What if I do not know what to answer or what to ask? I am very conscious of my accent as well. What if I get hired but I messed up with my job? What if I'd totally forget what I learned while doing my job? It will take me time to go through the course again and refresh my learning. There won't be anyone beside me to guide me what to say or do when that time comes. I have a lot of worries to be honest. I have a lot of thoughts going on in my mind. But as I again said when I started this course [you can read it here: Experience | Enrolling at VA Bootcamp], I still can't imagine how this will turn out at the end but whatever the result is I will post it here. And from my post of My 1st and 2nd week experience, I still do not know how to use the skills I learned in landing an online job but I just need to keep learning, take the lessons every free time I get and I believe I will figure that out as I progress with the course. So I guess I will just have to take the remaining modules and follow what has been said and instructed there and see how it all goes. Gonna go eat some sweets for a while.